We still haven't had any luck getting all the family together for dinner. It is hard when you are dealing with 5 adult children, one of whom lives out of state and a teenager. I think the last time we were successful was in 2016, before we had the teen. But until then we will continue to enjoy them in bits and pieces. Last week we were able to spend time with Amy, Doug, Jessica, Julien, Melody and Marissa. We went to a play and then out to dinner. It was lovely. The weekend was quiet. We went out for Mexican with John and Kirsten on Friday and spent the rest of the weekend staying warm and snuggly at home. Tonight we are meeting Nicole, Pierre, Anthony for dinner at a restaurant located halfway between our homes. It is hard to get them out to our house with the amount of hours they work in the food service business, not to mention their home based businesses that they have. 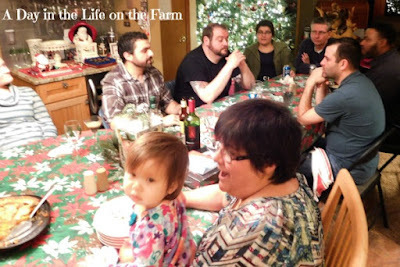 We did get to spend time with them on Christmas Eve while at Frank's brother's but were unable to get them here during the 12 days of Christmas as we were on vacation. So we are compromising by meeting them for dinner tonight and we are hoping that they are available to come over for Nicole's birthday celebration n a couple of weeks. The week is yet to be determined. Frank is working the Scuba shop all week while some of our gang is enjoying Fiji. Marissa has mid terms and half days of school all week. I have the food pantry on Wednesday.